Professor Stephen Hawking, who died in March this year at the age of 76, shed light onto the science of time travel in his last published book Brief Answers to the Big Questions. The world-renowned physicist found the idea of time travel a tantalising one and the topic often appeared in his work. 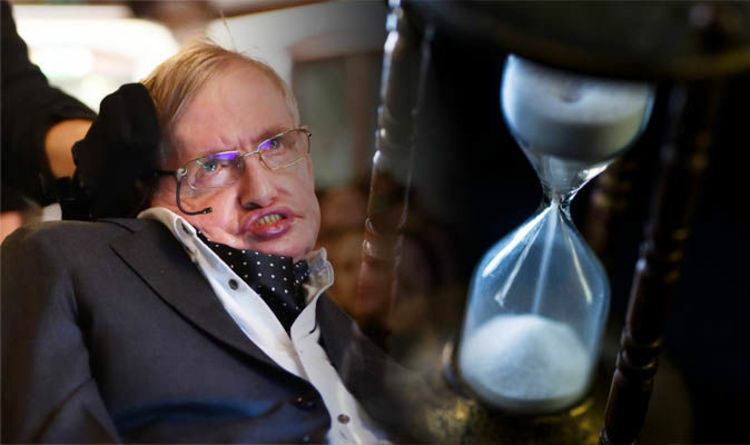 In his final book, published seven months after his death, Professor Hawking dropped major time travel revelations that could shake modern physics to its core. He studied the possibility of time travel within the confines of euclidian geometry, general relativity and the laws of physics. According to Albert Einstein’s law of general relativity, moving faster than the speed of light is key to travelling in time. But in order to power a spacecraft or machine capable of travelling at these immense speeds would require infinite amounts energy. Einstein already knew in 1905 this conundrum meant travelling backwards in time was not possible. However, Professor Hawking said Einstein’s research into gravity, space and time from 1915 may have found a solution to the problem. The physicist said the warping of space-time, which occurs near massive stars and black holes, could potentially be strong enough for humans to travel in time. This would happen by warping the fabric of the universe itself between two points in time and space – a time travelling wormhole of sorts. Time travel might not be possible with modern-day technology but it is within the realm of possibility future civilisations will harness this power. Professor Hawking said: “Einstein showed that it would take an infinite amount of rocket power to accelerate a spaceship to beyond the speed of light. “So the only way to get from one side of the galaxy to the other in reasonable time would seem to be if we could warp space-time so much that we created a little tube or wormhole. “This could connect the two sides of the galaxy and act as a shortcut to get from one to the other and back while your friend were still alive. “Such wormholes have been seriously suggested as being within the capabilities of a future civilisation. “But if you can travel from one side of the galaxy to the other in a weak or two you could go back through another wormhole and arrive back before you set out. Creating these wormholes would require vast amounts of matter with negative and positive mass – a concept made possible by quantum physics. But if time travel could be made possible in the future, why have time travellers not visited Earth yet? Professor Hawking said: “A possible way to reconcile time travel with the fact that we don’t seem to have had any visitors from the future would be to say that such travel can occur only in the future. “In this view one would say space-time in our past was fixed because we have observed it and seen that it is not warped enough to allow travel into the past. “On the other hand the future is open. So we might be able to warp it enough to allow time travel.